Amy Schumer gets knocked out and awakens with the kind of brain disorder that only happens in rom-coms (ones that gravely miss the point about objectification). During its almost-two-hour runtime, I Feel Pretty doesn’t once achieve the smart and sassy potency of Amy Schumer’s standup routine. The story follows Schumer as Renee, a New Yorker who struggles with low self-esteem and toils away at an unglamorous remote job for a beauty company. Then one day at a SoulCycle class, she slips off her bike, and a head injury causes her to believe she’s exceptionally beautiful though her looks haven’t changed at all. The extent to which Renee’s friends, coworkers and dates play along with her newfound perspective is the movie’s plot; ultimately, the lesson we learn—hey, beauty comes from within and confidence is more important than how we appear!—is totally predictable. I Feel Pretty is a curious mélange. Female comedians have been self-deprecating about their attractiveness for decades, but the film’s corporate sheen and feminist lip service (not to mention an abundance of SoulCycle product placement) feel all too 2018. 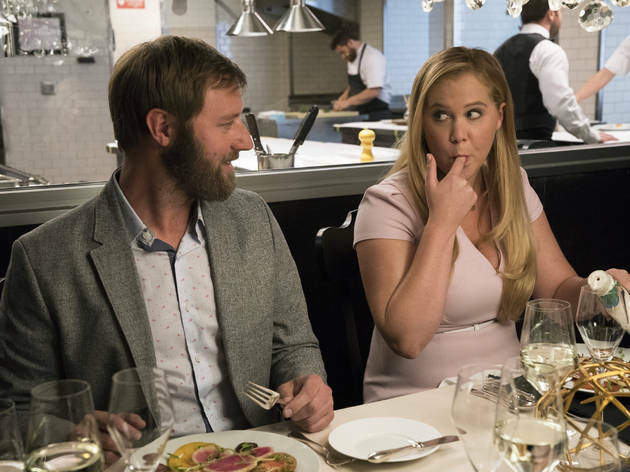 If the script committed more ardently to absurdity, it could have been enjoyable but, as co-directed by Abby Kohn and Marc Silverstein, I Feel Pretty lacks visual inspiration and runs on the fumes of one not-particularly-funny joke (this regular-looking girl thinks she’s super-hot). Truth be told, for a wide-release comedy, it’s a bit depressing. As proven in the early seasons of her TV show, Schumer is a talented performer, and her physical comedy here draws some chuckles (as does Michelle Williams’ turn as Schumer’s helium-voiced ditz of a boss), but I Feel Pretty is consumed by an annoying premise that seems practically designed to generate think pieces. At the end of the film, Renee delivers an inspirational monologue, articulating a blandly feel-good approach to inner beauty has all the depth of a Dove soap commercial. While it’s true that Schumer looks more like a “real woman” than the typical Hollywood star (whatever that means), the most progressive vehicle for her would be one that made no mention of it at all. I absolutely love the concept of this movie. Things are changing but appearances are still a big thing for girls and women out there. Feeling ugly, too fat and not worthy is a big issue. That moment in the clothing shop when Amy asks for her size and the store manager tells her they don’t have it and she should check online. Story of my (and 90% of women above size 10’s) life. A+ for Schumer for having written it down in her script. The idea of having to have had a brain injury to suddenly feel pretty can seem a bit too much but believe me for most women looking at themselves in the mirror is a struggle. You always seem to find something awful about yourself. Loving yourself and the way you look is hard. And it isn’t for of lack of trying. So in a weird way considering I will only see myself as beautiful after a major trauma seems quite realistic, and insightful really. As a starting point, amazing. As a movie, a bit clumsy. Getting lost in the third act, the storyline isn’t as revolutionary as it could be and sadly doesn’t use the quirkiness of the initial idea to its advantage. Shame, but a bloody good shot at something awesome and still entertaining nonetheless.